Hopefully strawberries aren’t too expensive in your area yet. I made this a few weeks ago and wanted to try it again to be sure it was as good the second time around as it was the first – sure enough – it was even better because we didn’t have a different pizza just before it. I found it in one of those food service magazines – tore it out and put it in a pile, so I’m not sure which magazine. This pizza stands alone and would make an excellent appetizer for any get together from two to two hundred. 9. Slice, serve and ENJOY! 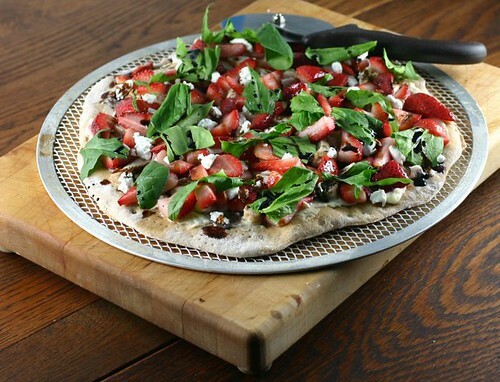 I love the idea of savory strawberry pizza, sounds excellent! Ok Mary this looks awesome and strawberries are just coming into season here…. No dot, dot, dot Wanda – get on it girl! I used the crust recipe you gave me and substituted some regular flour with wheat – it was good, but didn’t rise a whole lot (maybe too much wheat flour). I froze some dough raw to see if it would be my crust of choice. The damn dough balls actually roze in the FREEZER! The next week when I went to go use them it was VERY strange to see! I froze them after the first rise and am thinking I should try it again and freeze before any rising occurs. I’ve got a batch from Savuer magazine in the freezer now – if that works – it’s the one I’m going to publish. But there’s no reason we couldn’t publish more than one (hint, hint). Especially JP who’s the king of pizza – no crust from him yet and I hear he makes his in his bread machine. Wow! Great new snack idea! I love the strawberries with Balsamic Vinegar. It brings out their sweetness. Shall we bring this with us when we go out on Sean’s new boat this summer? WOW this is so creative. Unfortunately strawberries are still a bit expensive here but this will have to be made soon! Yum! We’ve been loving all the fresh strawberries lately, and at least here in Houston they’re local and cheap which is fantastic. Your pizza looks amazing. I’m thinking it might be good with arugula which we have tons of right now in the garden. Definitely going on the to-do list! I’ve never tried strawberries in anything savory, but I need to ! 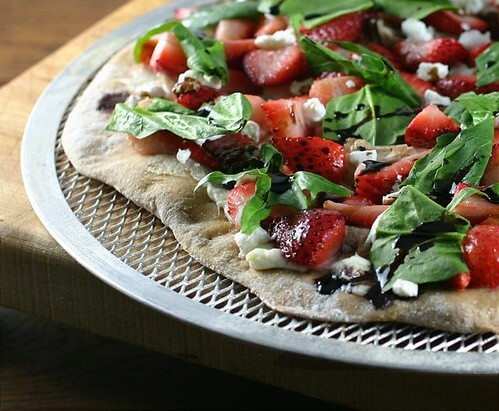 Strawberries on pizza, that is such a great idea! Look adorable. I just uploaded a new episode of my cooking show where I’m making Swedish Cupcakes (with my adorable nieces). Now see, this is exactly why I love being on Foodbuzz – I never would have thought to put strawberries on pizza and when I saw your post I was like WHAT?! It looks incredible and I will be trying this as soon as local strawberries come in season. Thanks for sharing! is it because strawberries aren’t available? I’ll bet it would be good with kiwi or raspberries too. this looks fabulous! love the colors and the perfect flavor combination. congrats on top 9! I’ll have to bookmark this recipe to make for a night when my husband is out… I love combining fruit with savory ingredients. This pizza is gorgeous! The goat cheese spread complimented the strawberry flavors. Hot or cold this pizza is a treat! what a great and brilliant pizza and the taste must be great and this is kind of pizza that everybody should try….. btw, i’m making pizza tonite for dinner. pizza ala pronto. What a unique pizza. I will surely have to give this a try. Thank you for the recipe.